Tasting wine is what the Carpe Vino Wine Club is all about and this year we upping the ante. Today and continuing every 2nd SATURDAY OF THE MONTH, Carpe Vino will host a WINE CLUB MEMBER TASTING & PICK-UP from 2-4PM. These Saturday tastings are exclusively for CV Wine Club Members (two people per membership) and will showcase a different selection of wines for you to taste before you buy! 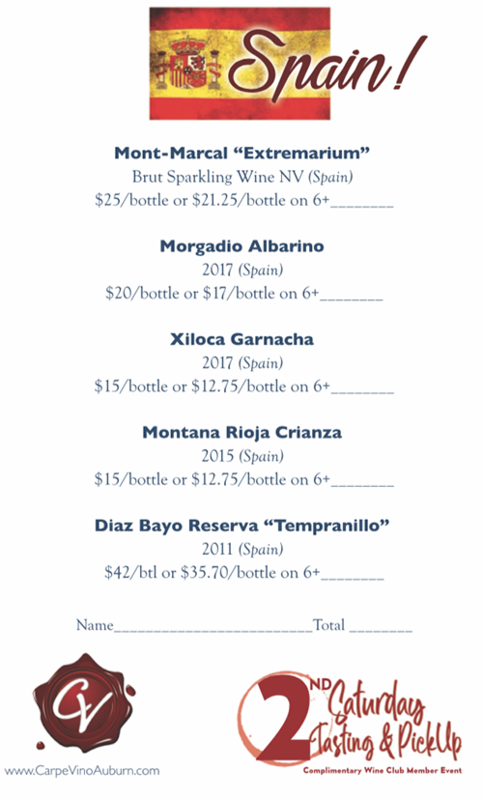 Join us today in the Carpe Vino “Wine Mine” from 2-4pm to taste FIVE stunning Spanish wines recently added to Carpe Vino’s ever-growing wine list. Chef Tim Dube & Chef Olivia Poulos will be offering a wonderful spread of appetizers to accompany your wines. Here is a look at what we will be tasting today!